Who knew that a dull grey concrete barrier along U.S. 101 in Burlingame, California near the San Francisco International Airport would become a tourist attraction? After Republican presidential candidate Donald Trump was forced to negotiate an unorthodox entrance – hopping a fence off the highway, essentially - into the California GOP Convention on Friday, looky-loos have started to visit there to snap selfies. 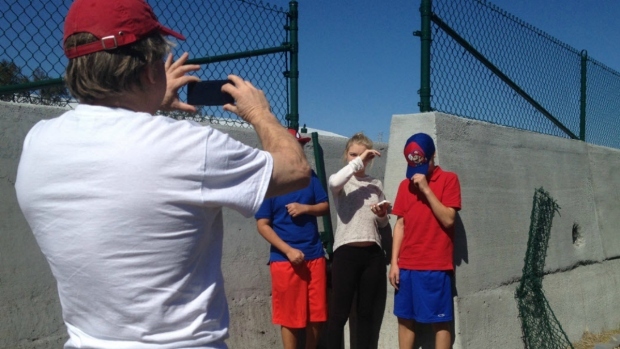 The political Calbuzz blog on Saturday captured one such family – a man and three children – taking pictures by the so-called “Trump Fence” to document the historical concrete barrier, where Caltrans has been working to widen the highway. Protesters blocking the entrance to the Hyatt Hotel in Burlingame, California, forced Donald Trump to jump a wall behind the hotel in order to make a planned appearance at the California Republican Convention on Friday, April 29, 2016. He got a lot of laughs when he kicked off his speech by joking: "I felt like I was crossing the border."